Have plenty of time to train and recover? Here's how to train multiple times per day — the smart way. I recently wrote an article dealing with the time crunched individual and making progress on just three short sessions a week. While this is the situation for the majority of strongman athletes, there are a few that have the luxury of being able to get in multiple sessions per day. When I owned my gym and was still competing, I would often train multiple times per day; I would do my main training with the elite athletes every afternoon. A secondary effort session would come by jumping in with my morning or evening athlete groups. On top of this, a stand alone cardio or conditioning session would be necessary when approaching a meet. Is this type of work something that would work for you? Let us examine what is involved. If you look at my micro workout referenced above, all the big movements are addressed, events are worked in, and the time consideration is paramount. Research indicates that this is all most people need to a good level of success. When talking about double or triple sessions per day, everything must increase. Calories, rest, planning, time, and motivation all become heavily taxed and you must meet those demands or the training will not be successful. If you can do all of that, then yes, it is worth it. Why? As you know, in all sports, elite and professional athletes spend most of the day in training. Four, six, or eight hour days are not uncommon for individual athletes preparing for a big event. While you can get almost everything you need from training three days a week, dedicated lifestyle training gives you the last 10 percent that is needed to be the best of the best. The body becomes its function. This is the idea behind Malcolm Gladwell’s book, Outliers, explaining how people become much better at skills as they accumulate time practicing it. His number is 10,000 hours to develop greatness. As you spend more time in the gym you body begins to specifically adapt to those movements. When you squat, pull, and press everyday, the body not only begins to get better at those movements, but also adapts to do them at the deepest level. Becoming mindless, we move through exercises in a flow state, with the body and mind in harmony. For an athlete at their very best, every movement has become as natural as walking, talking, and breathing. When you are lifting for multiple hours a day your central nervous system adapts in a similar way to a violinist who plays for the New York Symphony Orchestra. You can become flawless and not focus on your technique but shift your focus to remaining calm and being successful. What do the sessions look like? The very best part of training multiples sessions per day is your ability to relax and recover between movements. Say, for example, a morning session is programmed to squat and then log press is scheduled in the evening. A single session athlete will do these exercises in a short amount of time, often one right after the other. If significant effort is spent on the primary movement, the secondary is certain to suffer. By taking a few hours break, combined with a meal and a nap, you certainly will be able to handle more effort in the second session. That little bit extra on the second movement will add up over the course of the year leading to a better PR (assuming you are matching effort with recovery). When you are looking to be the very best, you will need every pound you can get and every millisecond you can save. This type of system is ideal for higher intensity and lower volume sessions. You can squat three separate days per week, press three days and get in hypertrophy work as well. Two, one hour lifting sessions a day will be much more effective than one, two hour workout. Your brain will also begin to rewire. Strongman training is uncomfortable, to say the least. The more often you are exposed to it the more comfortable you become even when it becomes downright painful. These adaptations are developed in the brain. The relentless practice and work will give you better ability to suffer during the most trying of contests. Just being able to go longer and harder is often the difference between first and second place. Conditioning is no longer an afterthought. Being in good shape is paramount to being a top performer in the sport. You may be strong but can your heart and lungs handle the stress of The Arnold World Championships? By dedicating more of the day to training, you can now do sessions dedicated to being in top cardio shape. Thirty minutes of low impact exercise twice a week coupled with two intense sled workouts per week will have a very positive impact on your ability to handle work loads. By adding in these sessions at a stand alone time you will be healthier and increase your ability to recover. 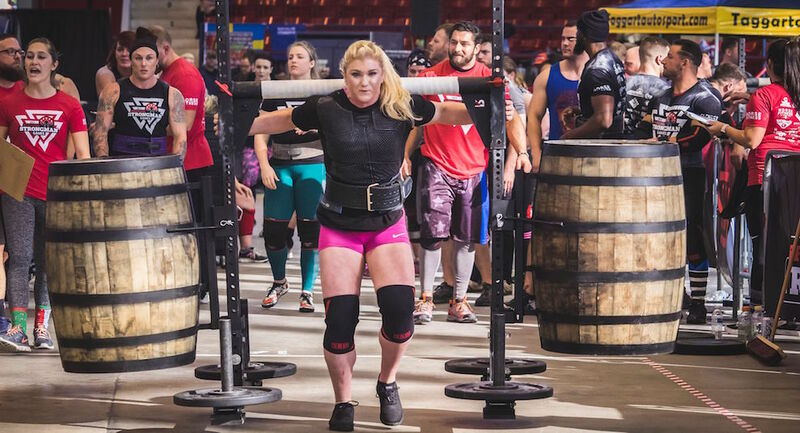 It may not be for every lifter, but this style of training is much closer to how elite athletes in any sport perform, and is closer to the methods of the Eastern European weightlifters of the 60’s through the 90’s when they dominated the sport. If you have the time, spacing out your training during the day makes much more sense if you are prioritizing performance. Start out slowly and try two splits in the beginning and then graduate by adding more days over the course of a few months. Featured image courtesy of Michele Wozniak.